Asteroids are rocky remains from the formation of the solar system about 4.6 billion years ago. There are millions of asteroids in the belt. The asteroid belt is between Mars and Jupiter. The size of the belt is estimated about a few hundred feet and a few hundred miles in diameter. Ceres these are the largest that they were classified as dwarf planets. Gaspra are made up of rocky and metallic minerals.The surface is covered with impact craters which is estimated 200 million years ago. Vesta are the third largest it has a very complex surface. 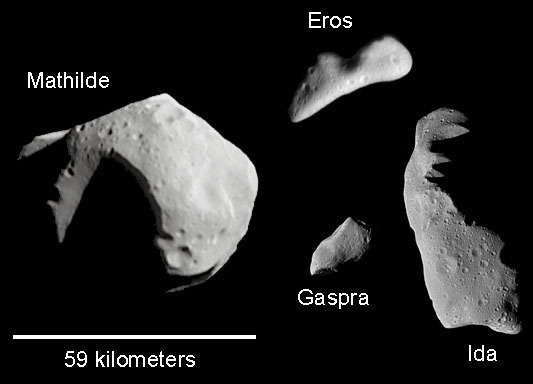 Eros is the only asteroid with a very odd shape and it is also found out side the main a asteroid belt. Comets are clumps of rocks and cold dirty ice. They orbit very close to the sun but some of them go past Neptune called the Kuiper belt. As the comet goes past the sun it melts a away a bit so a mixture of dust and gas is pushed from the comet by the solar wind. The long tail is called a coma. The tail always points away from the sun.